Giuseppe Manzino (Savona, Italy 23rd September 1929 - 4th July 1992) was one of the more interesting of late 20th-century Italian organ composers. Manzino was a versatile composer: he taught, gave concerts and composed, and in the latter capacity he won international prizes. His works have been performed in Italy and many other European countries, as well as in Japan, the USA and Latin America. Manzino�s language neither introduces novelties nor breaks with the past, but proves that the knowledge of past styles and historic continuity represent, even today, an inexhaustible source from which to draw. 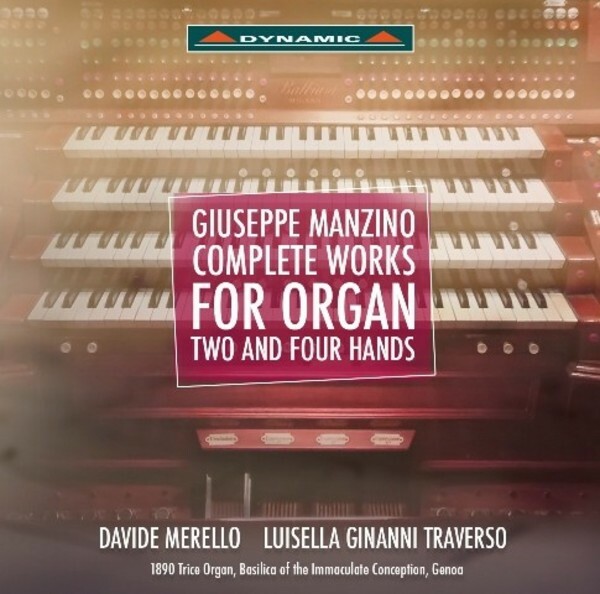 The instrument used for this recording, the monumental organ of Genoa�s Immaculate Conception Basilica, fitted in 1890 by English organ maker William George Trice and expanded at the beginning of the 1900s by the Balbiani firm, has done justice to the orchestral quality of the ampler works� writing, at the same time ensuring a wide variety of colours in the shorter ones, in which the beauty and variety of the 8� Fondi can be fully appreciated. After graduating in Organ and Organ Composition from the Conservatory of Genoa, Luisella Ginanni Traverso furthered her studies with renowned teachers such as L F Tagliavini, M Torrent, H Vogel, P Kee, G Schneider, J Langlais and X Darasse, studying in depth the different aspects of organ performance. Moreover, she widened her musical training by studying Harpsichord under the guidance of G Gentili-Verona, K Gilbert and S Ross. She teaches theory, rhythm, music perception, analysis and organ practice at the Conservatory of Genoa. She is appointed organist at the Immaculate Conception Basilica in Genoa. Davide Merello graduated in Organ and Organ Composition, and in Harpsichord under the guidance, respectively, of Emilio Traverso and Barbara Petrucci. Later he also earned a diploma in Baroque Organ with Lorenzo Ghielmi at Milan�s 'Civica Scuola di Musica'. A first prize and award winner in many international competitions, he has performed all over Europe and in South America as a soloist as well as in chamber and orchestral ensembles.